Analysts say these three defense stocks should be able weather spending cuts. 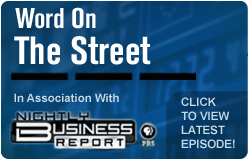 Editor's note: As part of our partnership with PBS's Nightly Business Report, TheStreet's Debra Borchardt joined NBR (watch video and read transcript here) to look at national defense stocks in the wake of Osama Bin Laden's death, and which ones are positioned to succeed despite potential budget cuts. NEW YORK (TheStreet -- Wall Street is still processing whether the death of Osama Bin Laden is a positive or negative event for the defense sector. On the one hand, Bin Laden's removal could be presented as an argument for a reduced military presence as the news is a undoubtedly a big blow to al Qaeda. But all the rhetoric from the White House has been that the war on terrorism is not over, and that it's expected others will step up to take the place of the organization's iconic leader. Prior to this news, however, defense spending was already on the chopping block as the federal government struggles under its massive deficit. The move of current Central Intelligence Agency Director Leon Panetta to Defense Secretary is seen as more evidence of that plan. Panetta spent four years as chairman of the House's Budget Committee and his congressional record has proven his willingness to when it comes to making defense spending cuts. In addition, Dr. Ashton Carter, the undersecretary of Defense for Acquisition, has predicted a number of big ticket arms programs could be canceled as soon as fiscal year 2013. One of the few bull cases for the defense sector is the replacement cycle for equipment that was sent to Afghanistan and Iraq. The environment for the equipment is so harsh, that most of it is expected to be left in those countries. Little is expected to be brought back to the United States or used in other arenas. Another bull argument is that the underperformance of defense stocks will limit further downside. However, Credit Suisse analyst Robert Springarn reminds investors that down cycles can last for years. There are defense stocks that can take advantage of this upheaval however. Small and midsize companies are racking up contracts at the expense of the big defense giants. Plus, some of the companies have exciting new technologies that the government and military are drawn to or can save the government money. Here are a few names worth watching. Esterline Technologies ( ESL gets 80% of its revenues from the aerospace and defense markets. The remaining 20% is from the application of those technologies into industrial markets. The company is seeing increased activity in military retrofit programs, and was just selected by Boeing ( BA for the avionics upgrade of the U.S. Air Force's KC-10 fleet of 50 tanker jets. As spending shifts towards retrofitting and recap, Esterline could benefit from the realignment in spending. According to Credit Suisse, the company could be instrumental in extending the life of military aircraft and land vehicles. In addition, the company lifted its full-year earnings outlook back in January. The shares have gained less than 5% so far in 2011, and have stalled since hitting a 52-week of $73.49 on Jan. 18. The forward 2011 price-to-earnings ratio currently sits at 13.6X. Esterline just wrapped up its fiscal second quarter in April and it's due to report those numbers on June 1. Wall Street is overwhelmingly bullish with nine of the 11 analysts covering the stock at either strong buy (4) or buy (5). CACI International ( CACI - Get Report) is less favored by Wall Street with a clear majority -- 13 out of 18 -- of analysts covering the stock at hold after a year-to-date run-up of 14%. The company provides information technology and professional services to the U.S. federal government. Its areas of expertise include cyber security services that prepare for, protect against, detect, react and respond to computer-based threats. Reasons for bullishness include CACI picking up two more contracts worth a total of $14 million last month. Also, on Monday, the company announced the approval of a $175 million stock buyback program ahead of its fiscal third-quarter earnings report after Wednesday's closing bell. The average analysts' view is for earnings of $1.03 a share in the March-ended period on revenue of $891.1 million. Last time around, the company topped the consensus view by more than 11% and lifted its outlook for the full year. CACI looks to be in a sweet spot if IT programs prove less vulnerable to savings initiatives. The company has a long-standing relationship with the Air Force and its command program that should work to its advantage as well. The bulls are betting that the company's products and services could increase efficiency and ultimately save money for the Department of Defense. Ceradyne ( CRDN is another interesting name. The company makes advanced technical ceramics used in defense products, and its stock has already gained an eye-popping 48% so far this year. The company just announced a new $3.5 million order for ESAPI (Enhanced small arms protective insert) ceramic body armor plates last week, along with posting a first-quarter profit of 95 cents a share, coming in 30 cents ahead of consensus, and significantly raising its outlook for the full year. Morgan Joseph is cautious about the stock, rating it a hold, but the firm also sees a "high probability" that the company could soon secure a major order for enhanced combat helmets. If this order, which Morgan Joseph estimates could be worth $21 million in revenue per quarter, comes through, the stock should rally further.